When you are moving in a straight line, or when you are travelling in a curve at very slow speeds, the path the bike travels is perfectly obvious. But when you are in a turn at higher speeds that path is not at all obvious, despite what you think. This article will attempt to put together a lot of concepts that have been discussed in other technical articles here such as Traction, Centrifugal force, Center of Gravity (CG), Steering angle, Drift, Slip angle (often confused with drift), Under- and Over-steering, Tire pressure, and Load. Individually, these are easy to visualize and understand, but in a dynamic world it is often hard to put together a set of them into a meaningful understanding of an issue. We will use the issue of 'Path travelled' to help you do just that. First, a quick review. Tires are flexible. Even with the maximum air pressure that they can safely be inflated to, they flex. As a result of that flexing, when you are in a turn at any reasonable speed, there is a difference between the direction the wheel is pointing and the direction the tire's contact patch is pointed. In addition, whenever you input a steering angle other than straight ahead, the contact patch slips a little as it attains the new direction. That is, a percentage of the contact patch is literally sliding across the pavement, not just rolling on it. This slippage results in what is known as a slip angle which is the difference in direction pointed to by the tire and the direction of travel. There MUST BE a slip angle or you could not change the direction your motorcycle is traveling. Combined, the flexing of the tire and the slippage of the contact patch result in a drift angle - the difference between the actual direction of travel and the steering angle used. This is called 'drift' because your vehicle is drifting slightly toward the outside of the path you told it to move in via the steering angle you input. I will make these preliminary comments clear as we go on. We start with a diagram that shows a view of a motorcycle from overhead while it is making a turn at VERY SLOW SPEED in that the motorcycle is assumed to be standing absolutely vertical. The dark arrowhead represents the instantaneous direction of travel of the front tire. By drawing a perpendicular line through the axles of each tire to the point that they meet, we derive the Origin (O) of the radius of the turn that is being ridden. 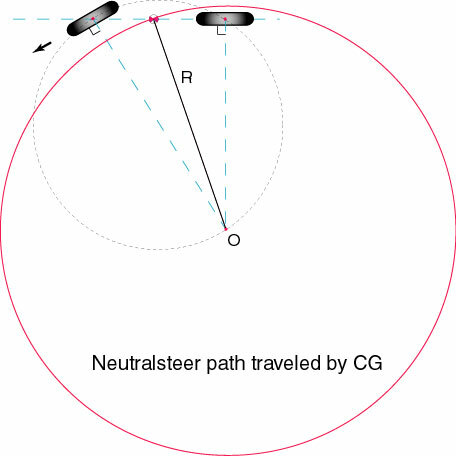 The dashed grey circle, then should be understood to NOT be the path of travel of the motorcycle. 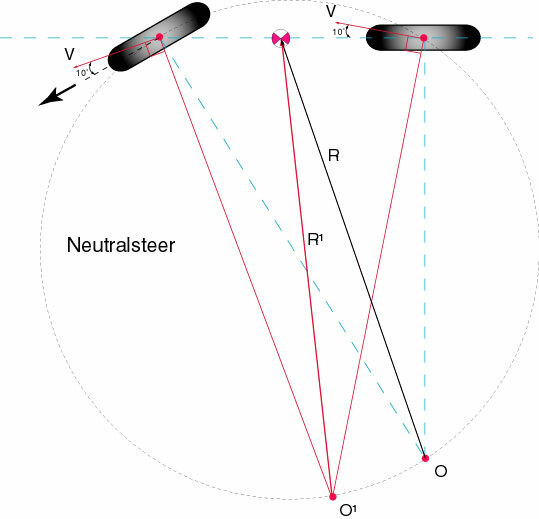 Rather, it merely shows a constant relationship between the TWO radii in a turn - the relationship that defines NEUTRAL steering (more about that soon). The dashed vertical line shows the radius described by the rear tire and the angled dashed line shows the radius described by the front tire. Because the radius for the rear tire is ALWAYS shorter than that of the front tire, you must recognize that the rear tire ALWAYS turns INSIDE the circle described by the front tire. Let's add the location of the CG for the bike and connect that to the origin of the circle as well. The new line is marked 'R' as it is the actual radius of the turn described by the CG. When that motorcycle is traveling at any meaningful speed, that dark black arrowhead no longer points in the direction the front tire is moving in that instant. Instead, because of tire flex and slip, both tires have an instantaneous velocity (V) which are pointing to the OUTSIDE of the actual path of travel. Drift, remember? With identical drift angles you see that the new radius (R1 is ALMOST identical in length to that of the original radius (R) but more obvious is that the new origin (O1) is almost exactly riding on that relationship circle. These will not be exactly the same but because the length of the wheelbase is so much smaller than the length of the radius and the placement of the CG is very close to the midway point between the contact patches, that difference is trivial. But the drift angles for the front and rear tires are usually NOT the same. The greater the load carried by a tire and the lower the tire pressure inflating those tires, the greater will be the drift angles. This explains, by the way, why after your tires warm up your bike will not drift as much as it does when the tires are cold. Furthermore, the greater the longitudinal forces exerted on the tires (acceleration and braking), the greater will be the drift angle. 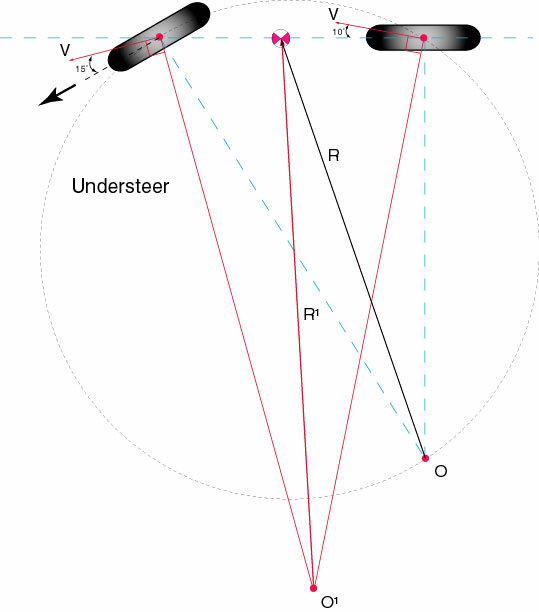 In another article on this site I claimed that automobiles tend to be UNDER_STEER vehicles while motorcycles tend to be OVER-STEER vehicles. In a car where the engine and transmission are both in the front you see an extreme example of this. Motorcycles, with the rider in place, tend to have more weight on the rear tire than the front and that is substantially increased when you add a passenger. Let us diagram again, this time using 15 degrees for the drift angle of one of the tires while the other remains at 10 degrees. From the last two diagrams you see that an under-steering vehicle goes WIDE in a turn while an over-steering vehicle cuts a tighter turn. One more thing that is not shown but you should be aware of is that if you take a turn too fast (beyond its critical speed) in an under-steering vehicle, the front tire(s) lose traction first while, because most motorcycles are over-steering vehicles, their rear tires lose traction first. This is all VERY GOOD news, actually. From a 'feel' point of view, your motorcycle handles with a positive feedback - confirming that you are making the turn as you desire while a vehicle with under-steer characteristics feels less than 'sure-footed' - like it is not quite doing what you ask of it.